Be the first to share your favorite memory, photo or story of Michele. This memorial page is dedicated for family, friends and future generations to celebrate the life of their loved one. 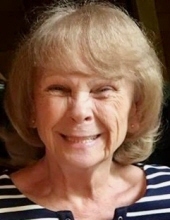 Michele M. Brady, 72, of Old Forge, passed away shortly before midnight on Saturday, March 16, 2019, at VNA Hospice House in Vero Beach, FL with her loving family by her side. Michele, the daughter of the late John and Catherine (Baird) Platler, was born in Utica on November 2, 1946. Michele graduated Utica Catholic Academy and attended MVCC and Utica College. On October 11, 1969, Michele and Richard J. Brady married in St. Paul’s Church, Whitesboro, and shared a blessed union spanning 50 years. A passionate and dedicated educator, Michele taught special needs children with the Oneida County BOCES in New Hartford until her retirement in August of 2002. She was a member of St. Bartholomew’s Church in Old Forge as well as a member of the NYS Retired Teachers Association. Michele was a very loving wife, mother, grandmother, sister, and friend. She is fondly remembered for her humorous and charmingly mischievous nature; every year on April Fool’s Day, Michele would go out of her way to prank family and friends in quite creative ways. Michele’s passions also included kayaking and spending time with family at her “camp” in the lovely Adirondacks, crafting, listening to country and ’50s era music, but most importantly, sharing her joy for life with those closest to her. Surviving are her husband, Richard (ret. UPD), Old Forge; sons, Richard Brady (Amelia Shen, Esq. ), Charlotte, NC, and Dr. Michael (Dr. Karen) Brady, Auburn, NY; grandchildren, Quinn, Keegan, and Kyleen Brady all of Auburn, NY; sister, Colleen Cooper, Lancaster, NY; sisters-in-law, Eileen Nicalek, Kathleen DiMarco, Donna Brady, and Sheila (Peter Shannon) Brady; brothers-in-law, David (Edith) Brady, Terry (Paulette) Brady, and Charles (Ellen) Brady; lifelong friends Bob and Roswitha Trudell, Carrolyn “Cowafoo” Genter, VA, and many nieces and nephews. She was predeceased by her brother, Brian Platler; sisters-in-law, Mary Hayes, and Marge Carroll; brothers-in-law, John Brady, Peter Hayes, Mario DiMarco, Chester Nicolek, and William Carroll; beloved pets Ashes, Tigger, and Gizmo. Michele’s family extends their gratitude to the staff at both the VNA Hospice House and Indian River Medical Center in Vero Beach, FL for all their care and compassion. Relatives and friends are invited to attend her Memorial Mass at St. Bartholomew’s Church on Saturday, May 4, 2019 at 11 am. Interment will follow in Riverview Cemetery. Arrangements are with Dimbleby Funeral Homes, Inc., 128 Fern Ave., Old Forge. Remembrances in Michele’s name may be made to the VNA Hospice House, 901 37th St., Vero Beach, FL 32960. Envelopes will be available at the church. To plant a tree in memory of Michele M. Brady, please visit our Tribute Store. "Email Address" would like to share the life celebration of Michele M. Brady. Click on the "link" to go to share a favorite memory or leave a condolence message for the family.